If you are an athlete or a bodybuilder, the chances are good that you have been looking into all of the benefits that come with boosting your levels of human growth hormone in the body. While HGH is necessary to promote muscle development while cutting back on the amount of fat in the body, undergoing HGH treatment is not something that most athletes want to take on. You have the chance to work with Holistic Solutions so that you can learn all about using Sermorelin for athletic performance drugs in La Jolla for a safer, more natural option. 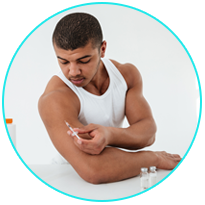 HGH injection therapy can be risky and there are a number of side effects that you could be subjected to. However, you can get the results that you are longing for by simply working to stimulate the pituitary gland using Sermorelin injections to help your body produce higher levels of HGH. Sermorelin is not actually a growth hormone but it is a type of growth-hormone-releasing substance that works on your pituitary gland so that you will have a higher output of HGH. There is a very little risk of experiencing side effects and you are not going to overdo it because the endocrine system in your body will not allow the gland to put out too much of the HGH. This is also an injection therapy that you can obtain by working with a professional naturopath like Dr. Joseph Dubroff at Holistic Solutions. This will give you all of the assurance that you need in knowing that the Sermorelin is authentic and safe. Whether you are looking to boost your muscle mass and have more energy or you are hoping to improve your game performance, this can be an effective and viable option for you. Holistic Solutions can help you with Sermorelin for athletic performance drugs in La Jolla. Call (619)272-2133 for more information or to set up a time for an initial consultation.